Looking at total ad spend alone; the short answer is “similar to last year.” However, when broken down product by product, we learn that even though half of Small and Medium Businesses are not increasing their overall ad dollars by much, they are adjusting how they are allocating those ad dollars, and more money is moving to digital media. 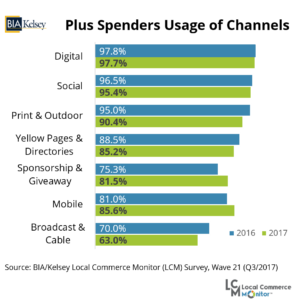 According to BIA/Kelsey’s Local Commerce Monitor (LCM), half of higher spending small and medium-sized business (numbers are based on businesses that spend $25,000 each year on advertising) will maintain what they are doing in 2018, while 45% plan to increase their spend. Only 4% plan to decrease. The survey shows that these businesses are using an average 17 different media channels. Traditional Media is still a key component; however, they are absolutely mixing in more digital and specifically more mobile. 85% of businesses surveyed indicated they are already using mobile advertising in some form, and they intend to increase that usage next year. With opportunities like geofencing, geo retargeting, weather triggers and even tracking in store visits, advertisers have more mobile options than ever before.